Ahh comfort food for a cold (not to mention snow-covered) Monday evening. Delight. To me, comfort food equals anything that regularly showed up on the dinner table when I was a child, is easy to put together, and makes the entire house smell delicious while it cooks. Today, my comfort food of choice is stuffed peppers. It seems to me, that of all the comfort foods out there, stuffed peppers seem to get pushed to the corner and forgotten. I've not quite figured out why however, since they are so tasty and delicious. The great thing about stuffed peppers, besides being quick and easy to put together, is all of the different things they can be stuffed with. The most traditional stuffing usually includes a mixture of beef, rice and tomatoes. This meatless Monday, I decided to venture out on a limb with a new stuffing recipe that evokes a memory of days-gone-by and incorporates some very summery flavors into this never-ending winter. Also, for all of you lacto-vegetarians out there, this one's for you! (Lacto-Vegetarian = someone who does not eat beef, pork, poultry, fish, or animal flesh of any kind, but does eat dairy products). Step One: Gather the ingredients. You can substitute chopped raisins for currants if you can't find them. Step Two: Cook the couscous, and combine the ingredients for the filling in a large bowl. Step Three: Prepare and arrange the peppers in a 8x8 baking dish and stuff with the filling. Don't forget to add 3/4 inch water to the dish before baking at 400 degrees for 55-60 minutes. Step Four: While the peppers are baking, use a blender or food processor to make the sauce. Transfer the pepper to your plate, spoon the sauce over the top, and enjoy the first bite! 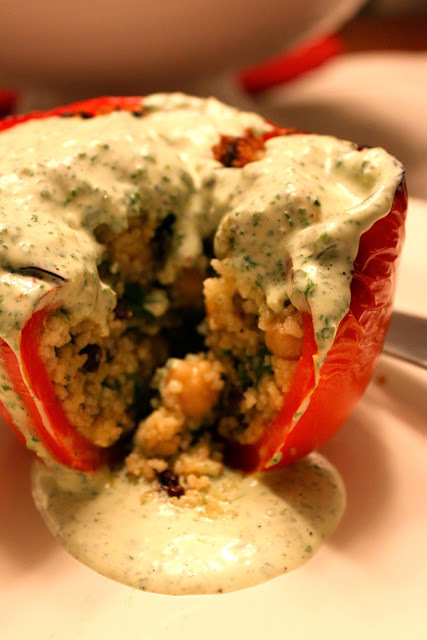 COUSCOUS-STUFFED PEPPERS WITH BASIL SAUCE | Yield: 4 servings | Total Time: 1 hr 15 min. *NOTE: If you can't find dried currants, substitute raisins, slicing them into halves or quarters before incorporating into the filling. FILLING: In a medium saucepan, bring chicken broth and cumin to a boil over medium-high heat. Remove from heat and stir in the couscous. Cover the pan until the couscous is tender and all the liquid is absorbed, about 5-6 minutes. Transfer the couscous to a large bowl and add the beans, currants, spinach, feta and 1/4 C olive oil. Season with salt and pepper, to taste. Stir until all ingredients are combined. *NOTE: If the tops are browning too quickly, tent with foil. SAUCE: In a blender or food processor, combine basil, creme fraiche, olive oil, water, garlic, lemon juice, sugar, salt, and pepper. Blend until smooth. Adjust seasoning with salt and pepper. After plating the stuffed peppers, spoon the basil sauce over the top and serve. Do you have a favorite stuffed pepper recipe?